Real time search has become a buzzword this year. With Twitter increasing its popularity search engines like Bing or Google Search are aiming to make their search results real time or at least closer to that. We have seen some attempts already. Google for instance has included new time based filters for their search results that allow users to search for new content that has been published in the last hour. And with url hacks it is even possible to drop that figure below the one hour mark (see Google Real Time Search). Twitter on the other hand adds another dimension to search. Not to every search but to specific search terms that are time related. Think for instance about news of plane crashes, earthquakes and other disasters and basically anything that benefits from real time observations. 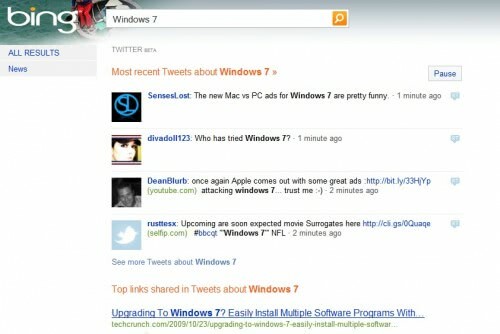 Bing has already included Twitter in their search engine. The subpage of Bing displays popular topics on Twitter by default. A search or a click on a popular tag will display the latest tweets and top links shared by Twitter users about the selected topic. Google on the other hand has just announced that they will be adding Twitter results to their search engine as well in the coming months. According to the announcement only search terms that can benefit from real time observations. The main question that neither Microsoft nor Google are addressing at the moment is how the quality of the content is evaluated. Since the content is displayed more or less in real time there is no time for a manual control of the content. How are they going to differentiate between good and bad - true or false - content. What's your take on the development? It’s up to the user to decide what content is god/bad true/false.